Description of "MANAGEMENT 3.0 (eBook)"
Management 3.0 is a revolution that has begun unraveling itself. 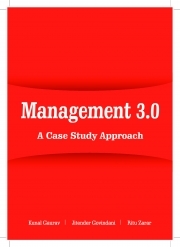 The book “Management 3.0: A Case Study Approach” seeks to help management students as well as educators by offering range of cases exemplifying the theories and practices under the umbrella of Management 3.0.The cases in this compilation cover a cross section of business verticals and address a plethora of business objectives. The cases selected for this book will certainly prove to become conversation points among students and young professionals. 1. Dr. Kunal Gaurav, Associate Dean (Strategic Research), ICBM – School of Business Excellence, Hyderabad – 500048, India. 2. Prof. Jitender Govindani, Director (Academics), ICBM – School of Business Excellence, Hyderabad – 500048, India. 3. Dr. Ritu Zarar, Chairperson, ICBM – School of Business Excellence, Hyderabad – 500048, India. Reviews of "MANAGEMENT 3.0 (eBook)"